If you’ve ever wanted to upgrade your floors with an easy, durable, and attractive material that comes in a near-limitless array of design options, Enjem’s Flooring America is your shopping destination. We offer the latest, most advanced surfaces for customers who won’t settle for less than the best quality and value. By utilizing our luxury vinyl flooring in Utica, NY, you can customize your home to suit your needs, both functional and aesthetic. Offering superior versatility and comfort versus other premium hard floors, this contemporary update on classic vinyl allows you to make the most of any home improvement project. Equip your space with surfaces that embody your unique style when you find the right products and the right price with our team. As trends change and perspectives in design evolve, what used to be a chic setup can turn into a drab drag on your property’s value and appearance. Even timeless visual appeal can be marred by wear and tear, and eventually, the moment comes when you need to refresh a room or the whole house. That’s where we come in. Our luxury vinyl tile and plank options give you the ability to enjoy brand-new shine without sacrificing your preferred style. Capable of effectively emulating both hardwood and stone, it provides the perfect opportunity to achieve your vision-- no compromise needed. If vinyl sounds like the right choice for your project, or if you want to browse other available options like quality carpet, reach out to us. Our team is the knowledgeable support network you need to make smart decisions as a consumer. 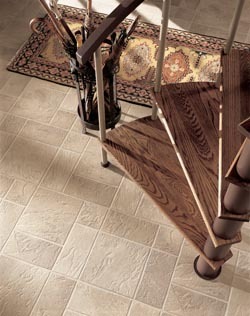 We can assist you with everything from price comparisons to strategies for luxury vinyl tile installation. With our professionals on your side, you never have to worry about getting the right surfaces for your remodel or renovation. Instead, simply relax and browse our inventory at your leisure. We’ll be here to answer any questions and ensure that you find the flooring you need to enjoy years of active living without worrying about what you’re walking on. Shop with expert support and buy with supreme confidence by turning to us any time you need resilient flooring for a local project. At Enjem’s Flooring America, you’ll always get service that goes deeper than the surface. Contact us today to learn how luxury vinyl can make the difference for your flooring project. We proudly serve Utica, Clayville, Clinton, Frankfort, and Herkimer, New York, as well as the surrounding areas.